Voter ID Laws are laws that require a valid ID to vote. 34 states currently have laws requiring some form of voter ID at the Polls. As of March 25, 2015, 32 of these voter identification laws are in force. Republicans say voter id is a necessary form of voter fraud protection. Democrats say in-person voter impersonation is in fact a essentially non-existent issue and that the laws are enacted to discourage voters who are likely to vote for the Democratic party in swing states. Fact: Research shows that 11% of US citizens – or more than 21 million Americans — do not have government-issued photo identification. Those most likely to not have an ID are students, seniors, low-income Americans, and non-white Americans. 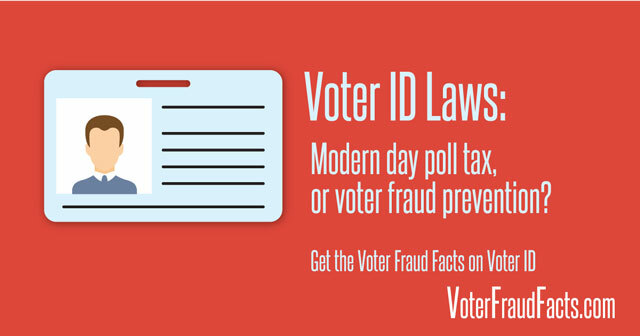 Keep reading to learn about voter ID or see our list of voter ID facts. What are Voter ID Laws? Before we discuss the facts on Voter ID let’s take a minute to understand what the voter ID law actually means. Most states have had long standing voter ID laws that require proof of identification. The new voter ID laws (enacted in 31 states) require that all voters show a valid state issued photo ID before being allow to vote. Essentially this means that these states have limited the forms of identification that can be used to vote. Each state has it’s own voter ID laws that define what it means in that state. Check out our section on specific voter ID laws by state. There are four categories states fall into in reference to Voter ID requirements they are Strict Photo ID, Non-Strict Photo ID, Strict Non-Photo ID, and Non-Strict Non-Photo ID. Strict vs. Non-Strict: In a strict state identification is required at the polls. If a voter does not have the required identification they can still cast a provisional ballot that will be counted if they return with a valid form of identification. In a Non Strict state they may be able to sign an affidavit or have someone vague for their identity. Photo vs. Non-Photo: This is the distinction of whether the form of identification has to have a photo or not. Strict photo ID in effect: Georgia, Indiana, Kansas, Mississippi, Tennessee, Texas, and Virginia. In addition, North Carolina and Wisconsin have strict photo ID laws that are not yet in effect. Photo ID in effect: Alabama, Florida, Hawaii, Idaho, Louisiana, Michigan, Rhode Island, and South Dakota. Strict non-photo ID in effect: Arizona, North Dakota, and Ohio. Non-photo ID in effect: Alaska, Arkansas, Colorado, Connecticut, Delaware, Kentucky, Missouri, Montana, New Hampshire, Oklahoma, South Carolina, Utah, and Washington. No ID required at polling place: California, Illinois, Iowa, Maine, Maryland, Massachusetts, Minnesota, Nebraska, Nevada, New Jersey, New Mexico, New York, Oregon, Pennsylvania, Vermont, West Virginia, Wyoming, and Washington, D.C. do not require ID to vote. Why Do We Need A Voter ID Law? Voter ID laws protect against voter fraud by ensuring that everyone who votes are who they say they are and are only able to vote once. No one would argue with the basic premise of the law. However, the recent updates to the Voter ID laws on a state level are severely limiting the use of forms of identification that can be used. These are the voter ID laws that are being called into question due to how it will make it very hard for many voters to cast their ballot. ** This table refers to laws that are in effect in 2014; Pennsylvania also has enacted a strict photo voter ID law, but it has been struck down by state court and is not in effect. North Carolina also enacted a strict photo voter ID law in 2013, with an implementation date in 2016. Therefore, Pennsylvania and North Carolina are not included in this chart of in-force laws. Arkansas’s strict photo voter ID law was struck down by the Arkansas Supreme Court, leaving a pre-existing non-strict, non-photo law in effect. Some might call Alabama’s law a strict photo identification law, because voters who don’t show a photo ID will generally be asked to cast a provisional ballot and then must bring the required ID to an election office by 5 p.m. on Friday after Election Day. However, there is an alternative: two election officials can sign sworn statements saying they know the voter. Some prefer to call Oklahoma a photo voter ID state, because most voters will show a photo ID before voting. However, Oklahoma law also permits a non-photo voter registration card issued by the appropriate county elections board to serve as proof of identity in lieu of photo ID. Texas enacted in 2011 a strict photo voter ID law, replacing its existing non-strict, non-photo ID law. It was implemented in 2013. On Oct. 9, 2014 a federal judge struck it down; on Oct. 14, a federal appeals court re-instated the law on the basis that it was too close to the general election to change the rules. On Oct. 18, the U.S. Supreme Court affirmed that the law can be in effect for the November 2014 election. South Carolina has a photo ID requirement, but it does offer an alternative for people with a “reasonable impediment” to obtaining a photo ID. See details in Table 2, below. -Current utility bill, bank statement, paycheck, government check or other government document with the voter’s name and address An election official may waive the identification requirement if the election official knows the identity of the voter. A voter who cannot exhibit a required form of identification shall be allowed to vote a questioned ballot. -Recorder’s Certificate An elector who does not provide the required identification shall receive a provisional ballot. Provisional ballots are counted only if the elector provides identification to the county recorder by 5 pm on the fifth business day after a general election that includes an election for federal office, or by 5 pm on the third business day after any other election. Connecticut§9-261 -Social Security card-Any other preprinted form of identification which shows the elector’s name and either the elector’s address, signature or photograph Elector shall, on a form prescribed by the Secretary of the State, write the elector’s residential address and date of birth, print the elector’s name and sign a statement under penalty of false statement that the elector is the elector whose name appears on the official checklist. DelawareTit. 15, §4937 -Photo ID-Utility bill-Paycheck-Any government document with voter’s name and address In the event the voter does not have proof of identity with them, he or she shall sign an affidavit of affirmation that he or she is the person listed on the election district record. -Public assistance identification If the elector fails to furnish the required identification, the elector shall be allowed to vote a provisional ballot. The canvassing board shall determine the validity of the ballot by determining whether the elector is entitled to vote at the precinct where the ballot was cast and that the elector had not already cast a ballot in the election.Florida uses signature matching: the voter signs the provisional ballot envelope. That signature is compared to the signature in the voter registration records. If they match, the ballot is counted. -Valid tribal photo ID A voter without one of the acceptable forms of photo identification can vote on a provisional ballot. He or she will have up to three days after the election to present appropriate photo identification at the county registrar’s office in order for the provisional ballot to be counted. Hawaii§11-136 Poll workers request photo ID with a signature. Acceptable types of ID are not specified by law. If the voter has no identification, the voter will be asked to recite his/her date of birth and residence address to corroborate the information provided in the poll book. -Student ID card, including a photograph, issued by a high school or accredited institution of higher education within the state of Idaho A voter may complete an affidavit in lieu of the personal identification. The affidavit shall be on a form prescribed by the secretary of state and shall require the voter to provide the voter’s name and address. The voter shall sign the affidavit. Any person who knowingly provides false, erroneous or inaccurate information on such affidavit shall be guilty of a felony. Indiana§3-5-2-40.5, 3-10-1-7.2 and 3-11-8-25.1 Specific forms of ID are not listed in statute. ID must be issued by the state of Indiana or the U.S. government and must show the following:-Name of individual to whom it was issued, which must conform to the individual’s registration record-Photo of the person to whom it was issued-Expiration date (if it is expired, it must have an expiration date after the most recent general election; military IDs are exempted from the requirement that ID bear an expiration date)-Must be issued by the United States or the state of Indiana Voters who are unable or decline to produce proof of identification may vote a provisional ballot. The ballot is counted only if (1) the voter returns to the election board by noon on the Monday after the election and: (A) produces proof of identification; or (B) executes an affidavit stating that the voter cannot obtain proof of identification, because the voter: (i) is indigent; or (ii) has a religious objection to being photographed; and (2) the voter has not been challenged or required to vote a provisional ballot for any other reason. -Government-issued public assistance ID card A voter who is unable or refuses to provide current and valid identification may vote a provisional ballot.To have his or her ballot counted, the voter must provide a valid form of identification to the county election officer in person or provide a copy by mail or electronic means before the meeting of the county board of canvassers. Kentucky§117.227 -Driver’s license-Social Security card-Credit card When the officers of an election disagree as to the qualifications of a voter or if his right to vote is disputed by a challenger, the voter shall sign a written oath as to his qualifications before he is permitted to vote. Louisiana§18:562 -Louisiana driver’s license-Louisiana special ID card-Other generally recognized picture identification If the applicant does not have identification, s/he shall sign an affidavit to that effect before the commissioners, and the applicant shall provide further identification by presenting his current registration certificate, giving his date of birth or providing other information stated in the precinct register that is requested by the commissioners. However, an applicant that is allowed to vote without the picture identification required by this Paragraph is subject to challenge as provided in R.S. 18:565. An individual who does not possess, or did not bring to the polls, photo ID, may sign an affidavit and vote a regular ballot. -A Mississippi Voter Identification Card An individual without ID can cast an affidavit ballot which will be counted if the individual returns to the appropriate circuit clerk within five days after the election and shows government-issued photo ID.Voters with a religious objection to being photographed may vote an affidavit ballot, which will be counted if the voter returns to the appropriate circuit clerk within five days after the election and executes an affidavit that the religious exemption applies. Missouri§115-427 -Identification issued by the federal government, state of Missouri, an agency of the state, or a local election authority;-Identification issued by Missouri institution of higher education, including a university, college, vocational and technical school;-A copy of a current utility bill, bank statement, paycheck, government check or other government document that contains the name and address of the voter;-Driver’s license or state identification card issued by another state. If an individual does not possess any of these forms of identification, s/he may still cast a ballot if two supervising election judges, one from each major political party, attest they know the person. -Any other photo ID that is determined to be legitimate by the supervisors of the checklist, the moderator, or the town or city clerk, provided that if any person authorized to challenge a voter under RSA 659:27 objects to the use of such photo identification, the voter shall be required to execute a qualified voter affidavit as if no identification was presented. -Verification of the voter’s identity by a moderator or supervisor of the checklist or clerk of a town, ward or city (not a ballot clerk). If any person authorized to challenge a voter does so under this provision, the voter shall be required to fill out a challenged voter affidavit before obtaining a ballot. A person’s identity may be verified by a moderator or supervisor of the checklist or the town or city clerk, but if any person authorized to challenge a voter under RSA 659:27 objects to such verification, the voter shall be required to execute a challenged voter affidavit.If a voter does not have a valid photo identification, the ballot clerk shall inform the voter that he or she may execute a qualified voter affidavit. The voter may then cast a regular ballot.By Jan. 10 in odd numbered years or within 90 days after any other election, the secretary of state is required to mail a non-forwardable letter to each voter who executed a qualified voter affidavit, notifying the person that a person who did not present valid photo identification voted using his or her name and address and instruct the person to return the letter within 90 days with a written confirmation that the person voted or to contact the attorney general immediately if he or she did not vote. Any such letters returned as undeliverable must be turned over to the attorney general, who shall investigate for voter fraud. Notice from any voter receiving such a letter that s/he did not vote is also forwarded to the attorney general for investigation. The secretary must also turn over to the attorney general a list of all voters who fail to respond to the letter to confirm that they voted. See the New Hampshire Secretary of State’s explanationfor details. North CarolinaNOTE: North Carolina’s voter ID law, enacted in 2013, goes into effect in 2016. Until then, North Carolina voters sign a poll book for identification purposes. New law in effect in 2016:An identification card containing a photograph of the registered voter that bears a date of expiration that has not passed and is one of the following:-NC driver’s license.-NC special identification card. There is no requirement that this card have a printed issuance or expiration date. A Veterans Identification Card containing a photo issued by the US Department of Veterans Affairs. There is no requirement that this card have a printed issuance or expiration date. A tribal enrollment card issued by a federally recognized tribe. If the card does not have an expiration date, it may still be used if the card has a date of issuance that is within 8 years of the date it is presented. A tribal enrollment card issued by a tribe recognized by North Carolina under Chapter 71A that is (i) issued in accordance with a process approved by the State Board of Elections requiring an application and proof of identity equivalent to the requirements for issuance of a special identification card by the Division of Motor Vehicles, and (ii) signed by an elected official of the tribe. Driver’s license or special identification card issued by another state, D.C., or a territory or commonwealth of the U.S. only if the voter’s registration was within 90 days of the election. People over age 70 may use an expired form of ID. New Law in effect in 2016:An individual who voted a provisional ballot due to lack of photo ID is to come in person to the CBOE no later than 12:00 noon on the day before the election canvass to seek the counting of the ballot. If the voter does one of the following at the CBOE, unless otherwise disqualified, the ballot will be counted:Present Photo ID – A voter may present photo ID that bears a reasonable resemblance to the voter. The elections officials are to determine if the photo ID bears a reasonable resemblance.Religious Objection – A voter who had not previously filed a religious objection declaration may show a HAVA document and sign a declaration of their religious objection, as well as have an opportunity to complete a declaration for future elections. North Dakota§16.1-05-07 -Valid driver’s license or state ID card-Valid passport or federal agency ID card-Valid government-issued tribal ID card-Student identification certificate(provided by ND college or university)-Long-term care identification certificate (provided by ND facility) If an individual offering to vote does not have or refuses to show an appropriate form of identification, he or she will not able to vote. A voter registration card issued by the appropriate county elections board may serve as proof of identity without meeting all of the above requirements. A provisional ballot cast by a voter who declines or is unable to produce proof of identity shall only be considered verified and approved for counting if the voter’s name, residence address, date of birth, and driver’s license number or last four digits of social security number as provided on the affidavit match what is in the registration database. -Government-issued medical card If the person claiming to be a registered and eligible voter is unable to provide proof of identity as required, the person shall be allowed to vote a provisional ballot pursuant to section 17-19-24.2. The local board shall determine the validity of the provisional ballot pursuant to section 17-19-24.3.Summary of section 17-19-24.3: The local board shall examine each provisional ballot application to determine if the signature matches the signature on the voter’s registration. If the signatures match, the provisional ballot shall count. If the signatures do not match, the ballot shall not count and shall be rejected as illegal. Cast a provisional ballot that will be counted unless the county election commission has reason to believe your affidavit is false. If you do NOT have Photo ID and do NOT have a reasonable impediment to obtaining one, or you simply forgot to bring it with you to the polls, you may still vote a provisional ballot. However, for your vote to be counted, you must provide one of the Photo IDs to the county election commission prior to certification of the election (usually Thursday or Friday after the election). South Dakota§12-18-6.1 and 6.2 -South Dakota driver’s license or nondriver identification card-U.S. passport-Photo ID issued by an agency of the U.S. government-Tribal ID card, including a photo-Student ID card, including a photo, issued by an accredited South Dakota school If a voter is not able to present a form of personal identification as required, the voter may complete an affidavit in lieu of the personal identification. The affidavit shall require the voter to provide his or her name and address. The voter shall sign the affidavit under penalty of perjury. All of the above must include a photo of the voter. With the exception of the certificate of citizenship, these forms of ID cannot be expired, or cannot have expired more than 60 days before the election. A voter who fails to present the required identification may cast a provisional ballot. The voter must present, not later than the sixth day after the date of the election, the required form of identification to the voter registrar for examination OR the voter may execute, in the presence of the voter registrar, an affidavit under penalty of perjury stating that the voter has a religious objection to being photographed or that the voter does not have identification as a result of a natural disaster declared by the president or the governor which occurred not earlier than 45 days before the date the ballot was cast. -Employee identification card Any voter who does not show one of the forms of identification specified in this subsection shall be offered a provisional ballot marked ID-ONLY that requires no follow-up action by the registrar or electoral board other than matching submitted identification documents from the voter for the electoral board to make a determination on whether to count the ballot. In order to have his or her ballot counted, the voter must submit a copy of one of the forms of identification to the electoral board by facsimile, electronic mail, in-person submission, or timely United States Postal Service or commercial mail delivery, to be received by the electoral board no later than noon on the third day after the election. -An employer identification card Any individual who desires to vote in person but cannot provide identification shall be issued a provisional ballot, which shall be accepted if the signature on the declaration matches the signature on the voter’s registration record. All of the above must include a photo and a name that conforms to the poll list. If the ID presented is not proof of residence, the elector shall also present proof of residence. An elector who appears to vote at a polling place and does not have statutory ID shall be offered the opportunity to vote a provisional ballot.An elector who votes a provisional ballot may furnish statutory ID to the election inspectors before the polls close or to the municipal clerk no later than 4pm on the Friday following Election Day.